Imam Feisal Abdul Rauf said the 'Ground Zero Mosque' is moving forward at Interfaith event on Friday. New York (CNN) - While all eyes are on lower Manhattan, nearly 200 people gathered more than 100 blocks north of Ground Zero on Friday night to honor 9/11 families and to recognize a decade of interfaith work at the Interchurch Center. "Tonight we want to commemorate the event and we are going to honor 10 families who lost victims on 9/11. Five are Muslim, five are not Muslim, to show that we share the pain, we share the hope, we share the prayer," said Imam Feisal Abdul Rauf. He hosted the event, In Good Faith: Stories of Hope and Resilience, along with the American Society for Muslim Advancement (ASMA) and the Interchurch Center. September 11 raised the profile of Islam in the U.S. and, according to Rauf, it caused the Western world to pay attention in a way that made Muslims the subject of intense suspicion. 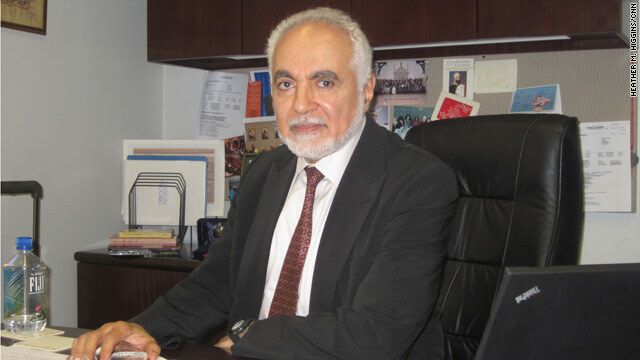 His goal is to build an American Muslim identity and enhance multi-faith dialogue. The event highlighted bridge-building projects and began with a harmonic recitation from the Quran by Ali Karjoovary. "We need a national healing around 9/11 and our hope is that we can achieve it," Rauf said. "And no matter how you slice it, I believe this healing will require the help of religious voices and American Muslims." Rauf, the founder of the Cordoba Initiative, an organization dedicated to improving understanding among people of all cultures and faiths, fell under intense scrutiny when plans to build an Islamic community center adjacent to Ground Zero were unveiled. According to Julie Menin, chairwoman of community board 1 in lower Manhattan, the community center, called Cordoba House, was approved by the local community in a vote of 29 to 1 in May 2010. Nonetheless, it provoked vocal opposition from some families of 9/11 victims and other groups. Rauf dispelled rumors that the project is now on hold. "It is always being moved forward," he said. "I've had this vision for over 20 years. The dream of establishing Cordoba House in New York is very much alive and we are actively pursuing the methods by which we can have such an institution." The project, intended to bring people together, has done more to tear them apart. But Rauf is optimistic about the future, in a nation that was built on the principle of religious freedom. He sees Cordoba House as something that can be replicated both in the United States and around the world. The 10th anniversary of 9/11 has been bittersweet for Rauf. While there are signs of progress, the healing process and building of ties between Muslims and non-Muslims is far from complete. His hope for the 20th anniversary of 9/11? "To bring all people together," he said succinctly. "The battlefront that I see is not between Islam and the West or Muslims and America but between all of the moderates and all of the extremists. We have to band together to combat the extremists of all religions," said Rauf. Up until last summer, Rauf was invited by the State Department to engage in public diplomacy work and to share his experience as an American Muslim, making four trips abroad in 10 years. However, his visit to the Gulf countries during the summer of 2010 was his last. "The controversy has changed my life in some ways," he said. The spirit of the evening was captured in the knotted rainbow ribbons that cascaded over the steps inside the chapel. The giant tapestry was a gift from the people of Norway during the height of the controversy one year ago. Rauf and his wife, Daisy Khan, ASMA executive director and co-founder, see it is a symbol of connectedness. Among those attending the event were Bobby Ghosh, TIME Magazine's world editor, veterans Fahad Khan and Matt Gallagher, and Rev. Dr. James A. Forbes, Jr., of the Healing of the Nations Foundation, who delivered a healing prayer before inviting all interfaith leaders to the front of the chapel to link hands as a sign of solidarity. Russell Simmons, media mogul and philanthropist, took part in honoring the memory of 9/11 victims, by presenting plaques to 10 families. One woman, who lost her husband, John Patrick Salamone, choked back tears while speaking about her children and the absence of their father. "I lived on the other side of hate," MaryEllen Salamone said, "And peace is a better alternative." Please read this article because our church in Washington, D.C. is uriging Americans to worship and praise president Obama because He is our personal Lord and Messiah and will protect us from insurgents overseas. Satan caused the kidnapping of journalists like Daniel Pearl and others but Obama is the new Jesus Christ of the world! For info, call us at 240–344-1323 or 202–895-3000. Thank you for your service! ISLAMABAD (AP) – A 72-year-old American development worker who was kidnapped in Pakistan by al-Qaida more than two years ago appealed to President Obama in a video released Thursday to negotiate his release, saying he feels "totally abandoned and forgotten." The video of Warren Weinstein of Rockville, Md., was the first since two videos released in September 2012. Weinstein, the country director in Pakistan for J.E. Austin Associates, a U.S.-based firm that advises a range of Pakistani business and government sectors, was abducted from his house in the eastern city of Lahore in August 2011. "Nine years ago I came to Pakistan to help my government, and I did so at a time when most Americans would not come here, and now when I need my government it seems that I have been totally abandoned and forgotten," Weinstein said during the 13-minute video. "And so I again appeal to you to instruct your appropriate officials to negotiate my release." It was impossible to tell how much Weinstein's statement, made under the duress of captivity, was scripted by his captors. The video and an accompanying letter purported to be from Weinstein was emailed anonymously to reporters in Pakistan. The video was labelled "As-Sahab," which is al-Qaida's media wing, but its authenticity could not be independently verified. The letter was dated Oct. 3, 2013 and in the video Weinstein said he had been in captivity for two years. Al-Qaida has said Weinstein would be released if the U.S. halted airstrikes in Afghanistan, Pakistan, Somalia and Yemen and also demanded the release of all al-Qaida and Taliban suspects around the world. The White House has called for Weinstein's immediate release but has said it won't negotiate with al-Qaida. The videos last year showed Weinstein appealing for help from the Jewish community and Israel's prime minister. we should help them build it. what's the problem? Good read, I just passed this onto a pal who was undertaking somewhat study on that. And he really bought me lunch as I found it for him smile As a result let me rephrase that: Thanks for lunch! See for yourself below.................The fairy in the sky did NOT create us ! ..NO ANGELS with PITCH FORKS the old pope KICKED them in OFF the TEAM last year ! where are the morals there ? and it only takes minutes now..............to simple for them maybe ? That mosque is an insult not only to the American people, but also to those who are not muslims. God will not be mocked. I live in America where we have freedom to practice our religions. Let the mosque be built. THANK YOU FOR KEEPING MY NAME IN YOUR PLATORM. HUSSEIN OBAMA MADE IN EGYPT. LET JONATHAN POLLARD GO NOW. This site is pure propaganda. Typical Muslim censored propaganda. Free speach does not exist when you have censord media like this.You are telling us you are special and know what is best for us. Clearly you do not! Your attempt to force your will on others will keep war a never ending dilema. People mistrust you now. Build your mosque and they will hate you!